"Wait!" I told Ken. "Let's stay two days. We need to see this." Convincing him was not difficult, and today we set out to explore the rugged Grand Canyon du Verdon in southeastern France. Virtually unknown outside Provence before 1905 when an electrical company employee was sent to conduct a geological survey of the Verdon River, the canyon is popular with tourists who day trip from the French Riviera. 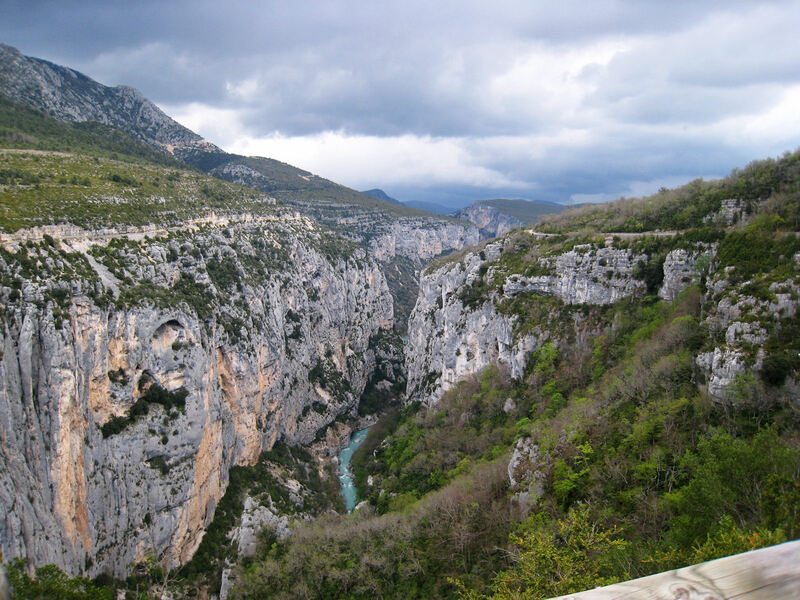 Like Arizona's Grand Canyon, the Verdon Gorge is a river canyon, formed by the Verdon River, which originates in the French Alps at an altitude of more than 7,000 feet. 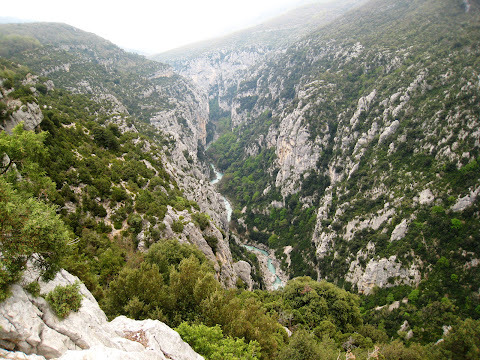 As the river plunges below, it has carved out fantastic gorges from the Jurassic period limestone. The canyon is about 30 miles long and up to 2,300 feet deep. The most dramatic part of the river's course is between the towns of Moustiers Saint-Marie and Castellane, and the legendary highway D952 tracks this northern rim. Driving along this route provided more than a few excuses for nail biting as the narrow two-lane road chiseled into the rocky cliffs carried us along steep precipices, often with only intermittent guardrails. Hair-raising excitement aside, the drive provided some spectacular views of the canyon and the startlingly green ribbon of the Verdon River tracing through its depths. The green color is caused by naturally occurring elements in the water. Returning on the south rim, the Route de la Corniche Sublime, we continued to enjoy one breath-taking view after another of this stunningly beautiful landscape. 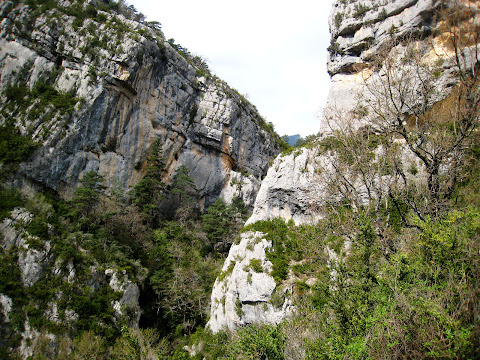 As we neared the end of the route approaching Moustiers again, we noticed that we were no longer stopping to photograph the incredible views. We had clearly reached an astonishment overload. 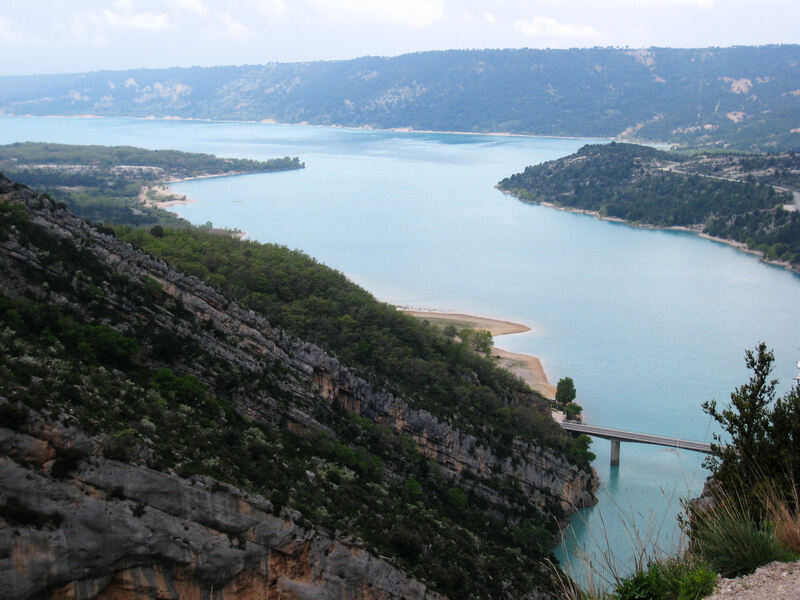 At the end of the canyon near Moustiers is the emerald green Lake Sainte-Croix, the largest reservoir in France. Between 1929 and 1975, five hydroelectric dams were built along the Verdon to harness the power of this mighty river for human needs. The Verdon Gorge area is a popular spot for sporting types, with hiking, rock climbing, boating, fishing and horseback riding among the promoted activities. Guides are available or even required for some of the more treacherous ventures. With only one day for our visit and rain threatening or falling, we did not have any opportunity to hike at this gorgeous place. A little rock-skipping at the lake had to suffice.